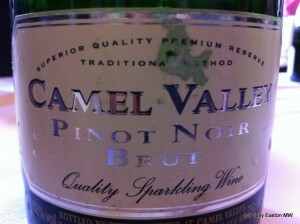 Available direct from Camel Valley, and Waitrose. I often personally prefer blanc de blancs so it was a wonderful thing to take such pleasure in this blanc de noir as well as appreciating its fine quality. It has a seductive lightness, elegance and white floral fragrance, with fine lines, a filigree mousse and integrity of structure. It has a light white pepper spiciness alongside a fine strawberry-space-dust sort of thing going on, with intensity of flavour and persistence. Normally part of the raison d’etre of traditional method sparkling wine is whole bunch pressing, but they crush the grapes at Camel Valley. Winemaker Sam Lindo explained their unusual approach saying “crushing lowers the acidity, it releases more potassium in the juice which helps tartaric acid to drop out during settling and fermentation”. They don’t want to do malolactic fermentation which would “lose the characters of being English” Sam added, those “delicate floral aromas and apples, pears, elderflower and strawberry”, so crushing to drop a bit of acidity sounds like a good plan. On top of this, they also use only stainless steel (i.e. no barrels), which is another way to preserve those delicate aromas and pristine flavours.